The Transport Section has the primary mission of bringing inmates to and from court proceedings and other correctional facilities. Along with that, they bring inmates to appointment outside of the facility and mandated humanitarian visits, such as deathbed and funeral services. 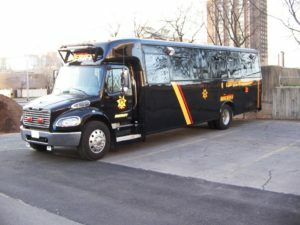 Anytime an inmate is required to be brought outside of the facility, the Transport Section is the first to be called to bring them. This is a Unique Mission Unit and requires tested skills and ability as a prerequisite for appointment. In addition, there is a rigorous certification program that staff must complete in order to retain the assignment.